Secretary General Jens Stoltenberg welcomed Norwegian Prime Minister Erna Solberg to NATO Headquarters on Thursday (4 May 2017) for talks on the Alliance’s continued adaptation and preparations for the meeting of NATO leaders on 25 May. 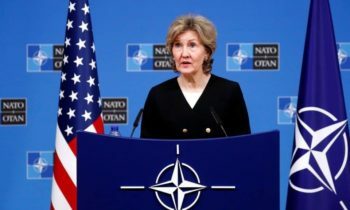 The Secretary General thanked Norway for its important contributions to NATO’s defence and deterrence, as well as efforts to project stability. 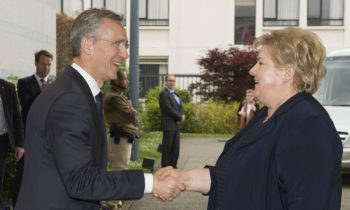 Prime Minister Erna Solberg, it’s a real pleasure to welcome you back to the NATO Headquarters. We’ve just finished an excellent meeting where we addressed how NATO is adapting to a new and more demanding security environment and also the upcoming meeting of NATO leaders on the 25th May. Norway is a founding member of the Alliance, Norway is a very committed member of the Alliance and we highly value the many contributions of Norway to the Alliance. You have been in Afghanistan with Norwegian troops for many many years, you continue to be there, you are going to participate in the NATO battlegroup in Lithuania, enhancing our presence in that part of Europe. You help us with support to NATO partners like Georgia, Ukraine and Jordan. And we also appreciate that Norway is the host nation for the Joint Warfare Centre in Stavanger. And all of this are important contributions to our collective defence, to the strength of the Alliance. Let me also thank Norway for Norway’s presence in the high North. And over the last years Norway has invested heavily in new capabilities, new frigates, you are in the process of buying new F-35 planes, and you’ve decided to buy new submarines and new maritime patrol aircrafts. So Norway is increasing its capacity when it comes to presence in the high North which is important for the whole Alliance. We discussed also the preparations for the upcoming meeting in May. It will be a very short meeting but it will be an important meeting because it will be the first visit of the new US President to NATO and to meet Allies and it will also be the meeting where we will meet the new French President. And I’m absolutely certain that the meeting in May will express NATO unity, NATO resolve and that’s something I welcome in times of more uncertainty, that we need a strong Alliance. The two main issues that we will address at the meeting in May are transatlantic bond, burden-sharing, and NATO’s efforts in the global fight against terrorism. When it comes to NATO’s role in the fight against terrorism we will address issues like Afghanistan. 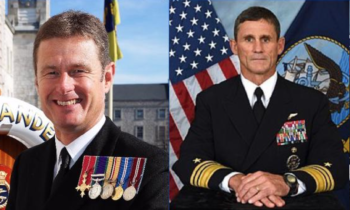 NATO has been there for many years, we are unwavering in our support for the Afghans, we will continue to provide them with financial support, train, assist and advice and we have to address the future of our Resolute Support Mission, the forces level, and how we can continue to provide support to the Afghans. We will also discuss how NATO can step up its efforts to provide support to the Counter-ISIL coalition. We provide some AWACS support, we train Iraqi forces, but we will look into what more NATO can do. Regarding burden-sharing, the transatlantic bond, all 28 Allies made a very important decision in Wales in 2014 to stop the cuts in defence spending to gradually increase and then to move towards spending 2% of GDP on defence within a decade and the good news is that we have turned a corner. After many years of decline we have now seen the first increase in defence spending across Europe and Canada and it is important that we keep up the momentum and make sure that we continue this positive development with increased defence spending across Europe and Canada. So there are many important issues on the agenda. I look very much forward to welcoming you back to NATO on the 25th May here in Brussels, where we are also going to have a hand over ceremony for the new building just across the street. So once again, welcome to NATO Erna Solberg. Oana Lungescu (NATO Spokesperson): Okay. Wall Street Journal. Q: Mr. Secretary General, a couple questions about the upcoming meeting. One, why is it too short? Two, are you making progress on the national plans toward, agreeing toward national plans? And finally do you personally support a counter terrorism coordinator, would this be helpful? And to the Prime Minister is 2 % of GDP a realistic goal for Norway? Do you anticipate Norway would adopt a national plan to reach 2 %? Jens Stoltenberg (NATO Secretary General): First on the CT coordinator. What we are now discussing is how NATO can do more in the fight against terrorism. How we can utilize the untapped potential in NATO because we have the structures, we have the experience, we have the knowledge. We have done it before in Afghanistan, but also in Bosnia-Herzegovina when it comes to the issue to train local forces, build local capacity. And I really believe that the most important thing we can do is to build local capacity, enable local forces to fight terrorism themselves and to stabilize their own country. 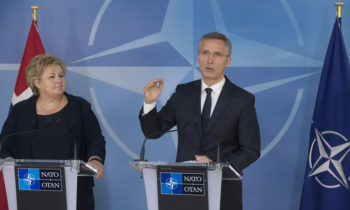 Exactly how we’re going to do that, exactly which measures we will agree on … it’s a bit too early to say but we are looking in to different measures addressing how NATO can step up its efforts in the global fight against terrorism. Regarding the national plans we are now looking into how we can make sure that we keep up the momentum. That we are able to continue the increase in defence spending we have seen over the last couple of years. And we have to also underline that burden sharing is of course about defence spending, but it’s also about capabilities and contributions to NATO missions and operations. And all these three strands of efforts are important and we are looking into what kind of documents, what kind of tools can we develop to make sure that we continue to see a positive development in these areas. Exactly what will be decided and announced in the meeting on the 25th of May. Erna Solberg (Prime Minister of Norway): And I would just like to say that Norway has last year proposed a long-term plan for the Norwegian defence which is an enormous increasement in the years to come in our budgets. And we are working towards the 2 % goal, the next four years we will have a large increase and then of course there will be a new revised plan every fourth year based on that. But we are increasing our support for the military activities and on the top of that of course there are new demands always on international cooperation and participations. Q: Secretary General about these national plans. In your view what do you think should be the main elements of those plans? Can you be a bit more specific about that? And also now Prime Minister Solberg mentioned the Norwegian long term plan, do you expect that Norway would have to be more specific about its plans? Is the long term plan enough or should Norway prepare to lay some more details on the table? Jens Stoltenberg: First of all regarding the national plans no decision has been made. So we are now in the process discussing within NATO with NATO allies exactly how we can develop different tools to make sure that we continue to deliver on what we promised in 2014. 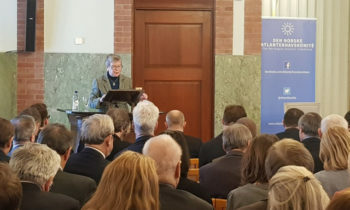 But the idea as it has been presented by some allies and which is now discussed in the alliance is to have documents where allies can report on how they are following up the pledge, both when it comes to defence spending but also when it comes to capabilities and contributions to NA TO missions and operations. And the whole purpose of having these kind of documents is that they will then provide us a better understanding of where different nations are when it comes to implementing the pledge we made together in 2014. And again, I’m confident that we will have decisions by the 25th of May and then I can go into more details. Erna Solberg: And I think our plan is moving towards all of the goals that is set by … we will have … we will not … we will be above 20 % in investments, we are transforming the capabilities that we have, we are working on the principle of inter-operability between Norway and others and we are contributing to the international operations both mainly through NATO but also in some of the others that the EU are doing and also some of the UN operations. Q: Mr. Secretary General on, in terms of the most relevant or perhaps most dangerous conflict right now, military conflict in Syria, two of your biggest allies are very active, the United States and Turkey but not exactly on the same side. I wonder at what point does that potentially become problematic and do you expect that to come up perhaps in the sidelines of the meeting later this month? And for the Prime Minister, as the Secretary General noted you’ll have two new colleagues from France and the United States. What might you say to them to really convince them that NATO is not obsolete? Jens Stoltenberg: As you know NATO provides support to the coalition fighting ISIL in Iraq and Syria, but NATO is not present in Syria as an alliance, some NATO allies are. And since NATO is not present on the ground in Syria I think I should refrain from commenting on, or to say, operational issues related to the activities of NATO allies. But I of course expect all NATO allies to coordinate their activities, especially in Northern Syria where there is a very complex and very difficult military situation. What NATO will do is that we will look into whether or how we can provide more support. We provide some support to the coalition with our AWACS planes -improving the air picture for the coalition operating over Iraq and Syria, and it may also be in other areas that we can provide more support for the coalition. Erna Solberg: My message to, well they are not my colleagues since I am a Prime Minister not a President but, remembering to understand the differences in a monarchy like Norway, but my biggest message to them is of course that the Atlantic tie has shown itself to be extremely important. The military capacities that we need also in the Atlantic is important, that was one of the issues that we were very concerned about before the Warsaw meeting because we know that if the Northern Atlantic part is controlled, the seaway, you will not be able to have support for Europe, in a crisis or conflict this will be a very difficult issue. And so it’s important to have this connection and I think when we started to work on this one of our partners was in fact France who have a different understanding of the Atlantic ties now I think than they had, if you look 20 years back, 30 years back and the understanding that the connection between North America and Europe is extremely important, also military.